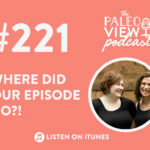 Home » Blog » TPV Podcast Episode 337: What’s the Deal With Celery Juice? Is celery juice really the miracle food that will solve all your ailments?! In this week’s episode, Stacy and Sarah are separating the celery juice fad facts from fiction to determine if the claims are really all they’re cracked up to be. 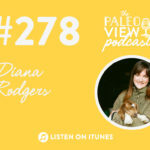 The Paleo View (TPV), Episode 337: What’s the Deal With Celery Juice? 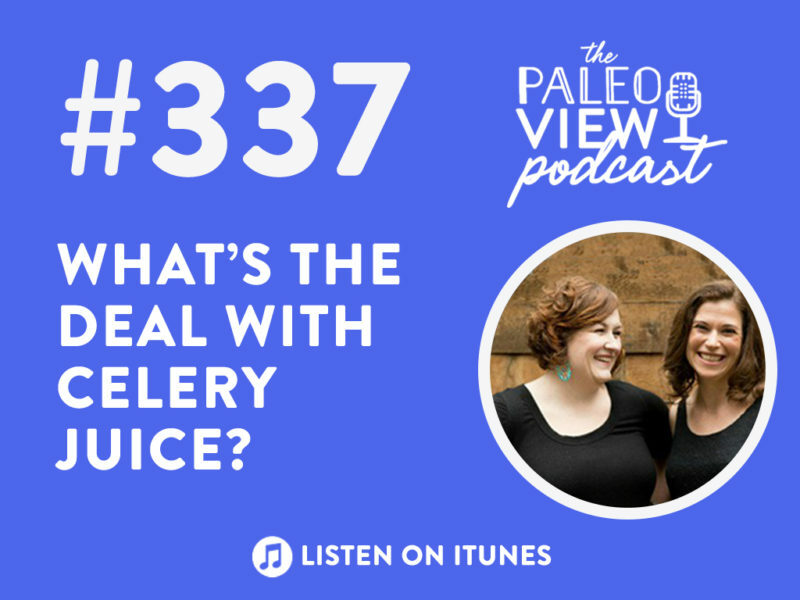 Stacy is a bit exhausted after traveling twice this month and tackling a huge project at work, which has her wondering… would celery juice help?! (2:00) What is the celery juice fad? Celery juice is a new fad that’s taking over the internet! 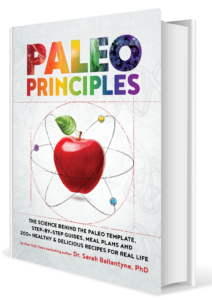 Influencers are promoting this fad diet left and right, claiming it is the secret to amazing health and will cure all these things. You’re supposed to drink 16oz of straight celery juice on an empty stomach every morning. And in JUST ONE WEEK, you’ll allegedly restore gut health, improve digestion, reduce inflammation, improve autoimmune diseases, starve out all the bad bacteria, balance your body’s pH, clean your blood, hydrate on a deep cellular level, reverse depression, etc, etc, etc. Sarah is very worked up about this (not in a good way)! And she’s here to get to dispell the myth, look at the science, and get to the bottom of it! Celery is a member of the parsley family. It’s a very nutrient-dense food. A 100g gram serving (approximately 2 stalks) has only 16 calories, but 1.6g fiber, 37% of the recommended daily vitamin K, ~9% of vitamins A, C, folate, potassium, and manganese, and ~3-4% of the B vitamins. Plus a few others. Despite being thought of as a “filler food,” celery has a lot of nutritional value. Does it really burn more calories to eat celery than celery contains? Sarah does agree that the energy you get from celery (in terms of calories) is basically nonexistent. Celery is very rich in polyphenols, which are important anti-oxidants. They’re anti-inflammatory, anti-aging, can reduce cancer risk, regulate blood sugar, be a neuroprotective, etc. Studies suggest apigenin can reduce inflammation, prevent cancer, prevent diabetes, improve brain health, reduce pain, and may have a calming effect both via the GABA neurotransmitter system and the HPA (fight-or-flight) axis. Studies suggest caffeic acid can reduce inflammation, prevent cancer, prevent toxicity associated with chemotherapy and radiation, prevent diabetes, prevent premature aging, prevent neurodegenerative diseases (like Parkinson’s disease), and reduce exercise-related fatigue. Studies suggest chlorogenic acid can reduce blood sugar, prevent diabetes, aid in weight loss, reduce blood pressure, aid in homocysteine detoxification, and enhance mood. Studies suggest chrysoeriol can reduce inflammation, regulate the immune system, prevent cancer, and prevent diabetes. Studies suggest p-coumaric acid can reduce inflammation, reduce intestinal inflammation, regulate the immune system, improve bone density, act as an antidepressant, prevent cancer, protect against kidney damage, and protect against tissue damage caused by drugs and alcohol. Studies suggest coumaroylquinic acid can increase activity of superoxide dismutase, one of the body’s most important endogenous antioxidant enzymes. Studies suggest ferulic acid is a particularly potent antioxidant that can reduce inflammation, prevent cancer, prevent toxicity associated with chemotherapy and radiation, prevent diabetes, prevent premature aging, protects the liver and lungs, prevent neurodegenerative diseases (like Alzheimer’s disease), and lowers cardiovascular disease risk factors. Studies suggest kaempferol can reduce inflammation, regulate the immune system, prevent cancer, act as an antimicrobial, prevent diabetes, reduce cardiovascular disease risk factors, prevent neurodegenerative diseases (like Alzheimer’s disease), improve bone health, and aid weight loss. Studies suggest luteolin can reduce inflammation, reduce vascular inflammation, regulate the immune system, reduce allergic responses, protect the brain, prevent cancer, prevent toxicity associated with chemotherapy and radiation, prevent neurodegenerative diseases (like Alzheimer’s disease), reduce pain, and may have a calming effect via the GABA neurotransmitter system. Studies suggest tannins can reduce inflammation, regulate the immune system, prevent cancer, are antimicrobial, improve blood clotting, reduce cardiovascular disease risk factors, produce liver necrosis, and prevent cavities. It’s true, celery has all these amazing things. But most studies look at celery extract (a concentration of all these good things in celery), but not celery juice. Studies on celery juice have looked at chemotherapy use in animals and have discovered celery juice helps preserve the body’s antioxidant capacity. This can helps reduce the side effects and improve the efficacy of chemotherapy. Sarah notes these are compelling reasons to consume celery. Stacy chimes in with a clarifying question: does the science say celery juice or extract is better than consuming the whole vegetable? Celery extract comes from blending the whole plant (celeriac, stems, and leaves) with alcohol (methanol or ethanol), strain it to remove the solids, freeze-dry it to evaporate the alcohol, reconstitute it, and add saline to turn it back into a liquid. Celery juice comes from juicing celery stalks (with leaves attached). Studies show that celery juice is comparable to other vegetable juices. It yields about 79% juice and the other 21% of the juice is thrown out with the fiber. 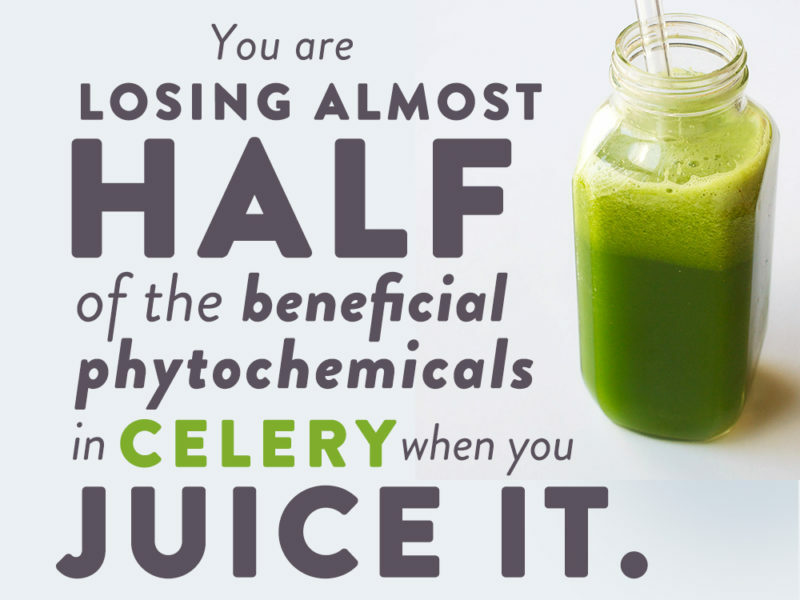 When you juice celery, you only get about 56% of the flavones, the main class of polyphenols, in the juice. The other 44% are trapped in the fiber (or pumice) that’s discarded. 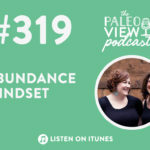 Stacy highlights this point, that the science says when you juice, you’re throwing away 44% of the beneficial qualities of that vegetable when you’re juicing it versus consuming it whole. You cannot buy celery extract. Celery seed extract is not the same thing as celery extract. People are juicing celery to try to replicate the benefits seen in the animal and cells. But it’s not the same thing. However, Sarah notes, the half of phytochemicals that do make it into the juice are interesting. The ones that do make it in are more easily absorbed than in the whole food version. But this doesn’t take into account the activities of gut microbiome. Most polyphenols are poorly absorbed. We only absorb 5% of the polyphenols because they’re locked in large molecules. Juicing helps make these polyphenols more available. Bottom line: eat more vegetables. Celery isn’t particularly unique when it comes to polyphenol content. Whole celery is more beneficial than celery juice. If you want to take advantage of all the polyphenols celery has to offer, start eating more celery. Add celery to soups or blend it into smoothies. For example, comparing celery juice to parsley juice, parsley juice had 10x more flavones (polyphenols). Eating vegetables (and consequently phytochemicals) is only beneficial! Sarah has yet to see a research paper that says otherwise. Celery juice is not going to cure all your ailments as claimed by influencers. There’s no science to support that. Don’t waste your money on an expensive juicer. Stacy and Sarah note that sometimes people feel so much better on juice fasts because they’re getting nutrients that their body is deficient in. If someone eats a standard American diet, devoid of vegetables, and suddenly start drinking vegetables, it’s not surprising that they’ll feel better. When something sounds too good to be true, it probably is! Previous Post: « Celery Juice: Fad or Fabulous?